I’ve been asked to document a curry recipe. 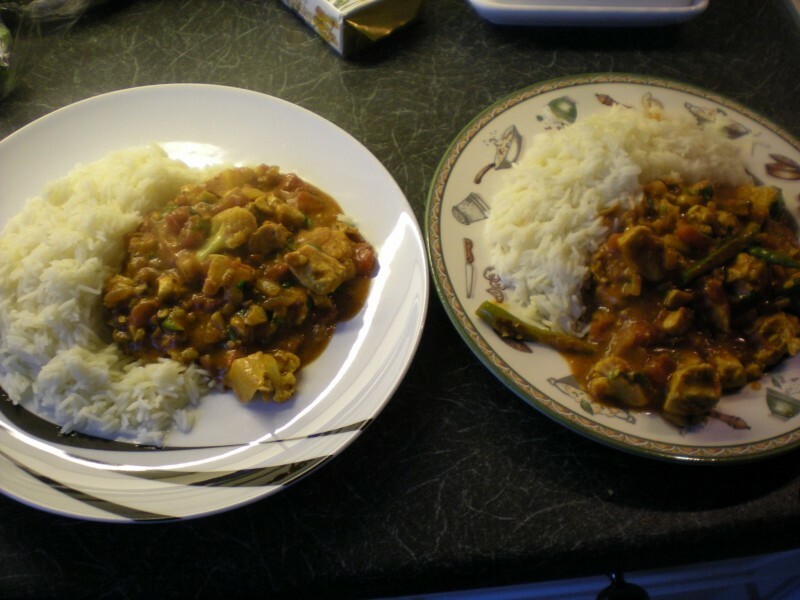 The thing is, my curries are a bit like snowflakes: each is unique. So I’ve decided to document my curry of the ‘moment’ – I may well revise this to be month/week/day as appropriate later. 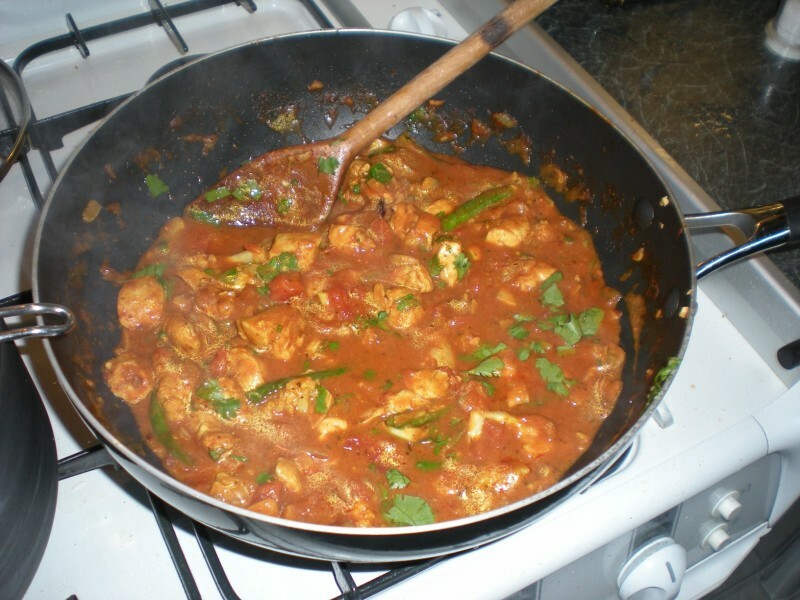 This then is a recipe for a chicken and vegetable madras or jalfrezi, depending on your view. If it were up to me I’d cook it with prawns, but Diane doesn’t like them so I’ve made it with chicken. Again, normally if forced away from prawns I’d have chicken on the bone, but chose to chop chicken breast to make this recipe more obviously interchangeable with prawns. 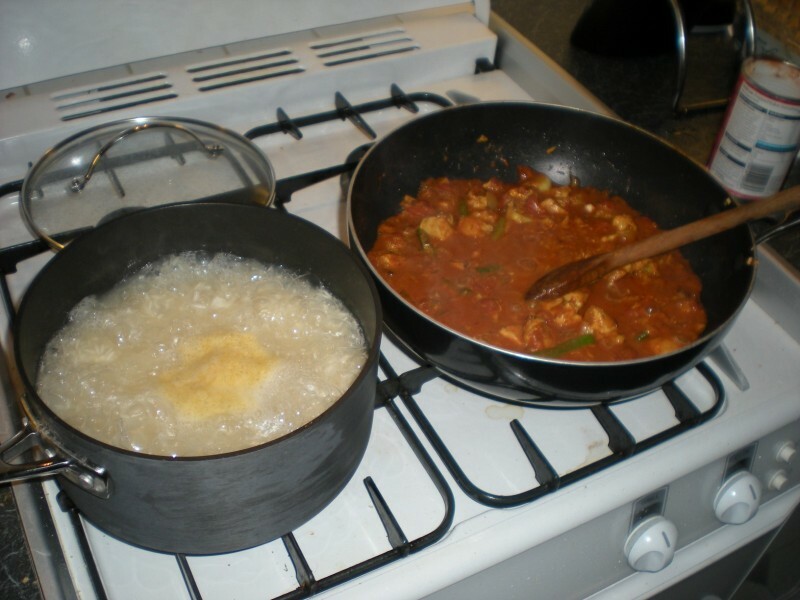 So here’s a recipe for a curry for two – fairly hot. 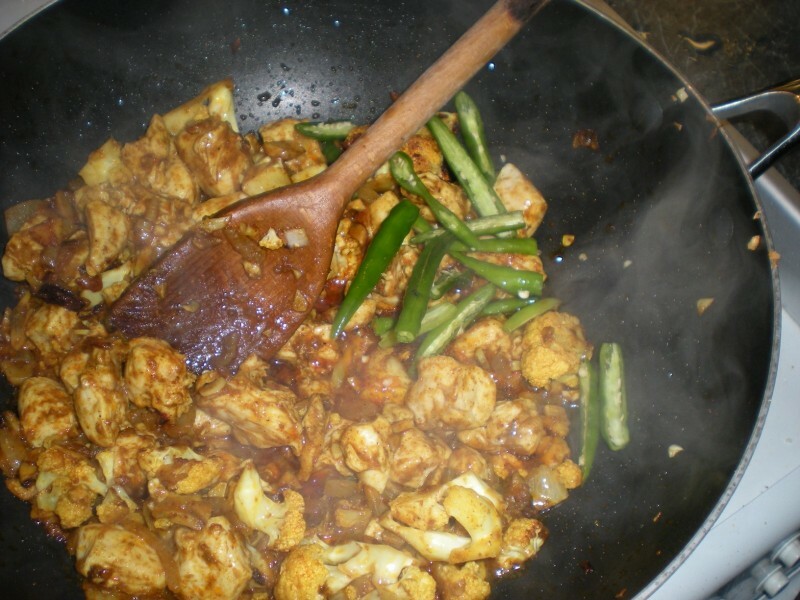 It is designed to be relatively healthy – I’m not aiming for the greasy thick curry house sauce tonight. 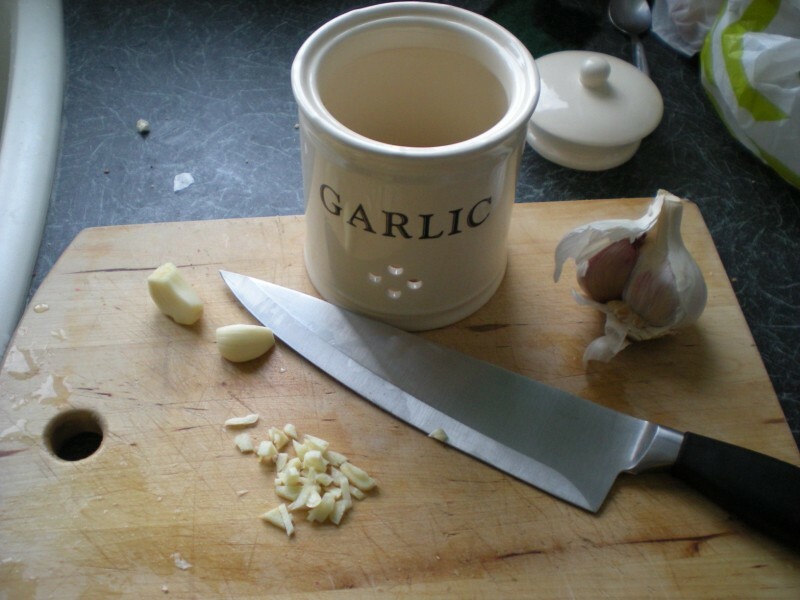 To start, chop some garlic. I chose three cloves; if you’re a pasty-often-unwell sort I’d advise eating more. If you’ve got a date, probably use less. 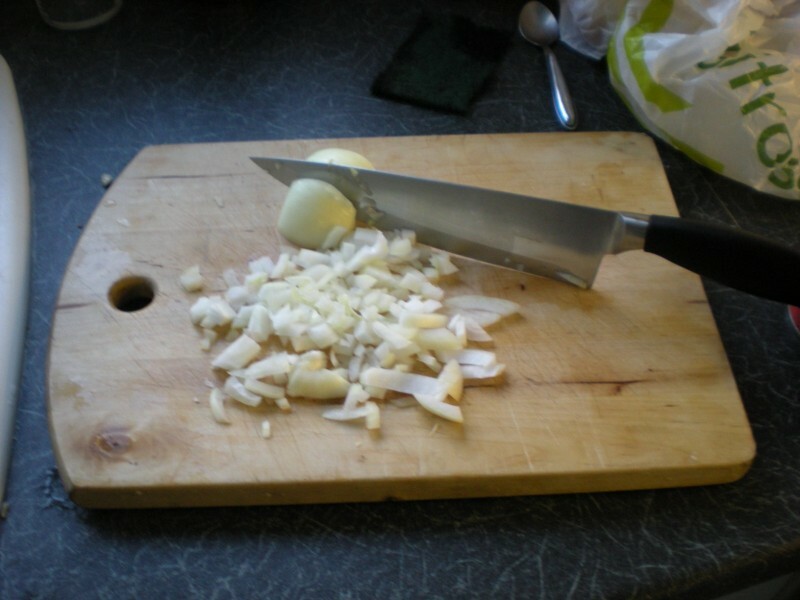 Then, peel and chop an onion. 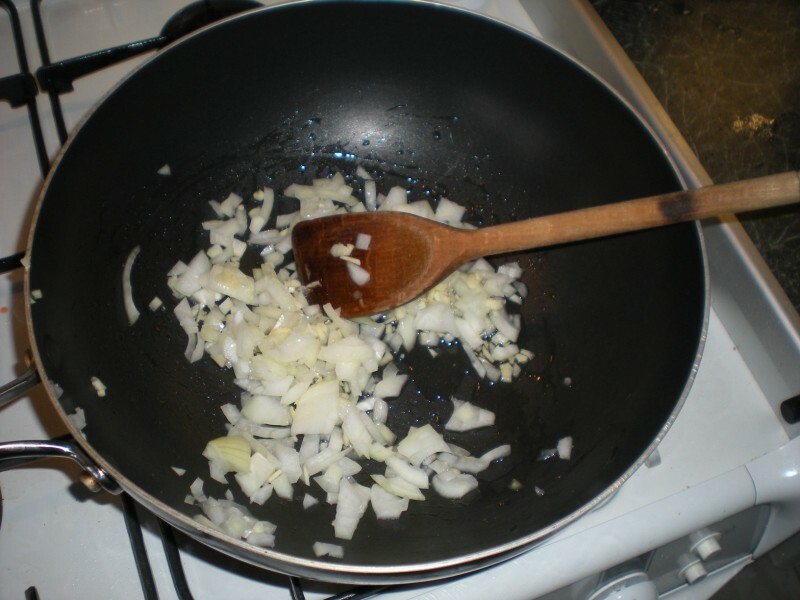 Gently fry this lot up in vegetable/sunflower oil on a low temperature – cooking without colour at this stage. 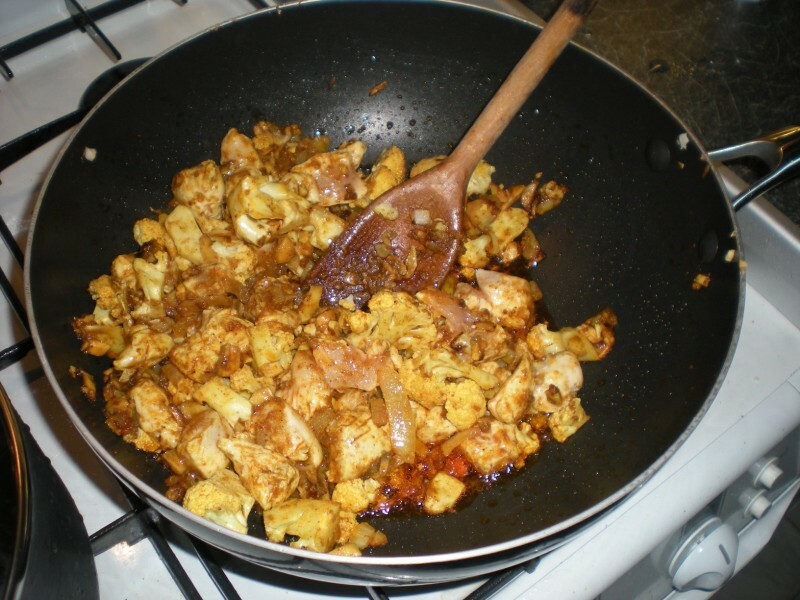 Get two large spoonfuls of Patak’s madras paste in the mix. Make absolutely sure you buy paste not pre-mixed sauce – the paste is excellent; the sauce atrocious. 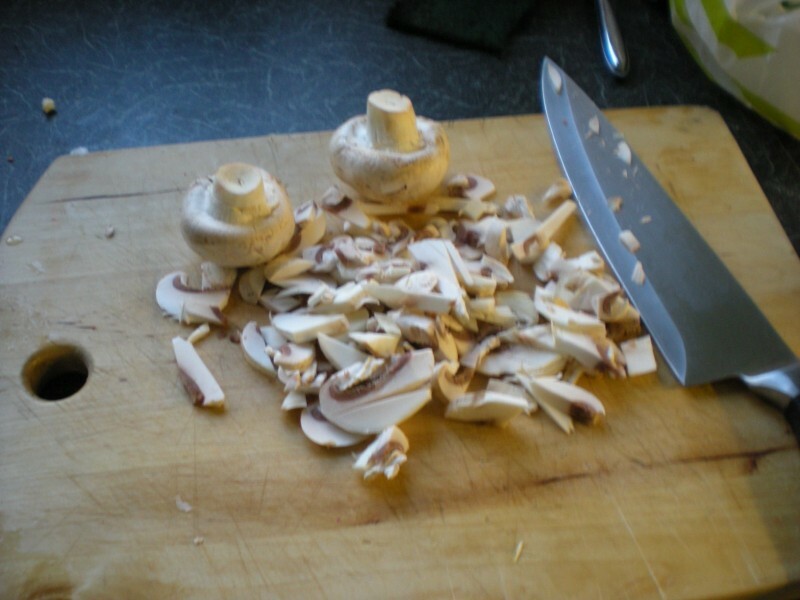 Chop 4 small cup mushrooms. 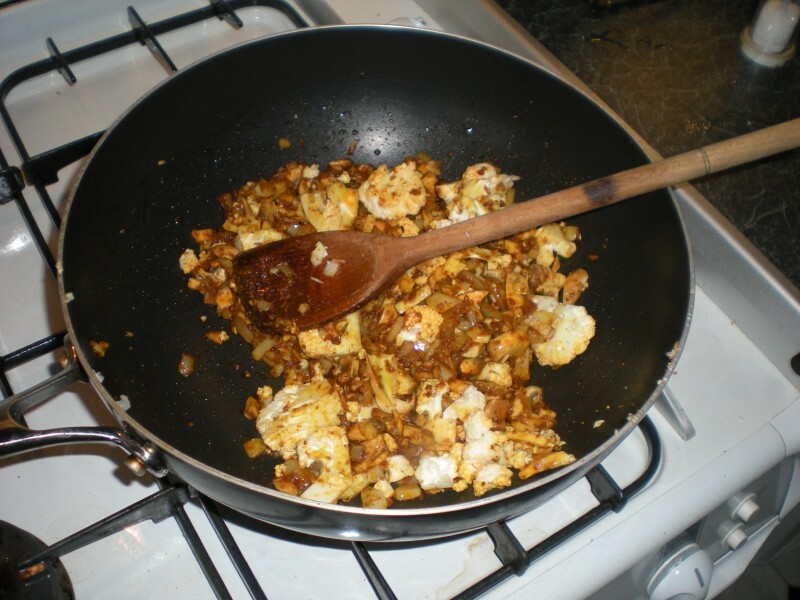 Add mushrooms and chopped cauliflower to the mix. Now turn the heat right up to fry that veg. In the meantime, chop the chicken (or open the prawns!). Then once the pan is nice and hot, add the meat. Once the water is boiling, add the rice. 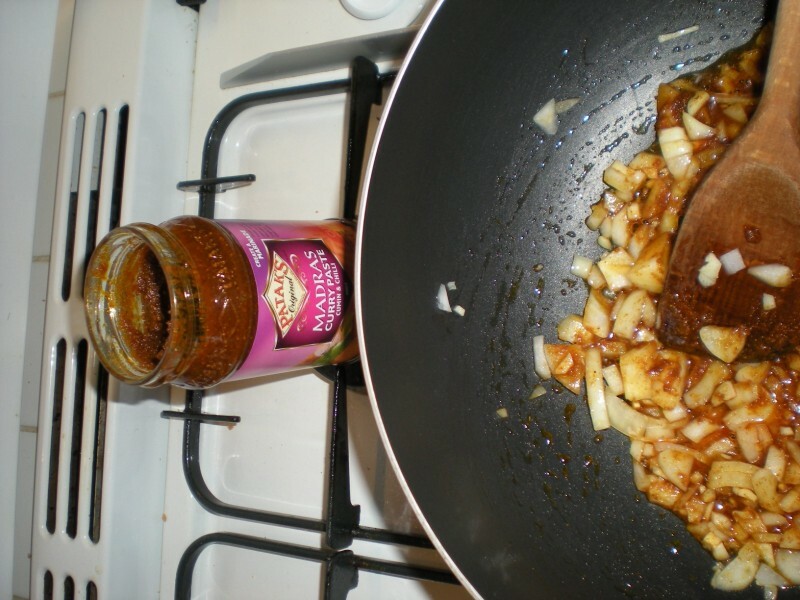 Once the meat is cooked, add the can of chopped tomatoes. Don’t let the chicken cook too much if it’s not on the bone – it’ll go all dry and chammy. Stir all this in. Next, if like me you like it hot, add some chilis. I’ve chosen to top and tail them, and then slice them along their length. This gets all the seeds into the mix, but allows girls to easily remove the greenery. 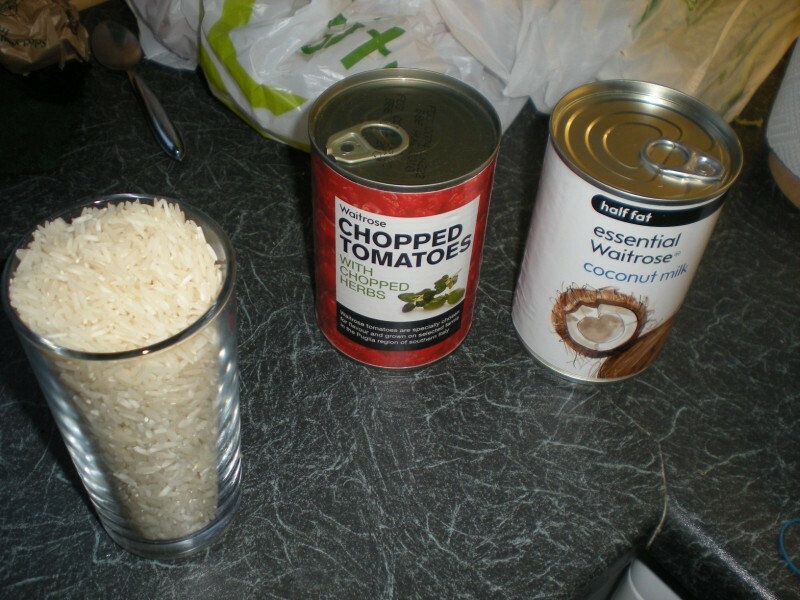 Next, open the coconut milk and empty almost half the can into the now empty chopped tomato can. Swill that around to mix it all up. Then, slowly (important to prevent separation), add this to the sauce. If you like it hot, add less; if not, add more. Keep an eye on the rice during all this. If a scum builds up as in the picture below, scoop it off with a spoon. Rice should be gently twirling in the water – not boiling too furiously (too hot), nor stuck at the bottom (too cold). Rice needs constant attention to get it right. Repeatedly check the rice – as soon as the grains aren’t hard in the middle, it is ready. 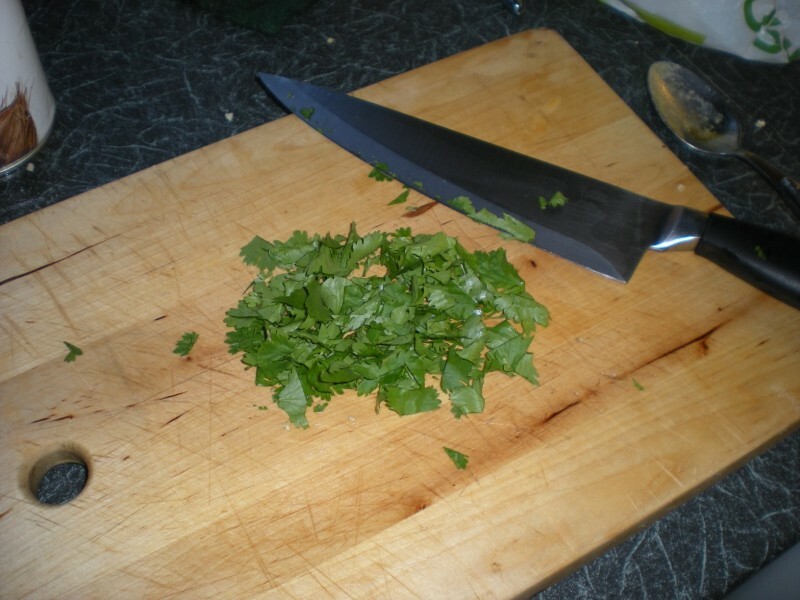 Sieve the rice, then roughly chop coriander. Sprinkle this on the curry. Then serve and enjoy with a nice bottle of red. Chin chin! 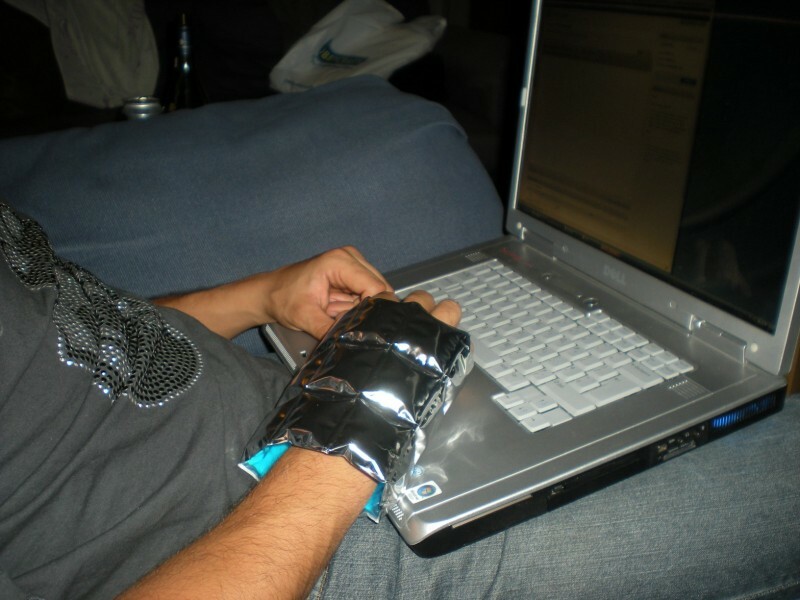 Finally, avoid burning yourself on a pan while adjusting the gas – the injury rather slows down the eating, and then the “writing up”. I used to use a sauce as the base but have been getting into pastes more. Looking forward to a proper curry when I get back. I’ll take some pictures/blog it and let you know how it goes! 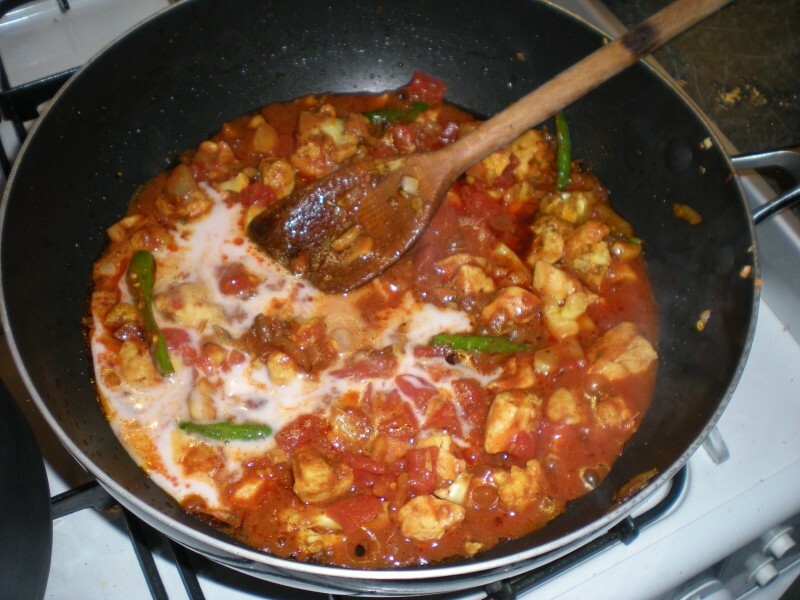 Excellent writeup, made me want to make it – so I did, all the family and the guests had the “mukerji curry of the night” tonight and it went down a treat, very nice indeed. Thanks for sharing it with us. PLEEEEEEAAASE can we have it tomorrow?